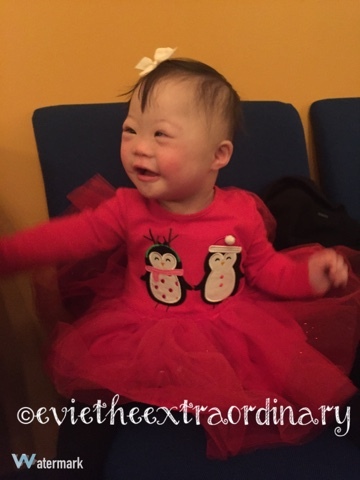 Evie the Extraordinary and Her Mommy: The Journey As We Go: Merry Christmas from Evie and her mommy! 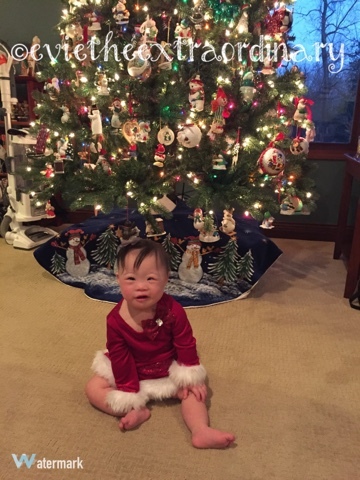 Merry Christmas to everyone from Evie! Evie has been busy meeting relatives and waving to the masses. She literally waves to everyone. She got so many presents, that Grandma has to bring some back for us when she comes back to Boston. Her favorite part of the presents was the wrapping paper! This is our second Christmas with Evie, but in some ways it feels like our first, because we were in the hospital last Christmas with a one week old baby! 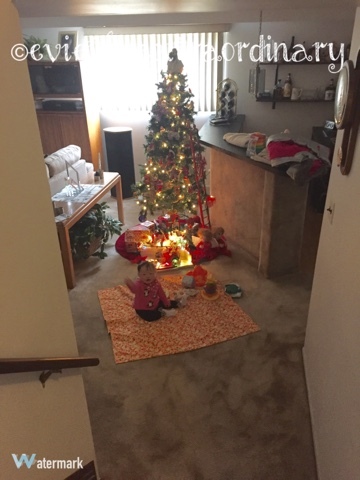 We've been working on extra tummy time for Evie during the holidays. Her upper body strength is great, but her legs don't want to move along with her arms to crawl! The best incentive to get her to move is her feeding tube syringe. This is good news and bad news. Good because we have something she really wants, and bad when she tries to grab the syringe while we are feeding her by g-tube. We have spilled quite a bit of water and formula this way! If you are the praying kind, please pray that she would be able to strengthen her legs so that she can crawl soon. We are grateful for how wonderfully she is doing. We have been extraordinarily blessed. Evie is so happy to look at all the lights up for the holidays. She is also happy that so many people want to carry her!